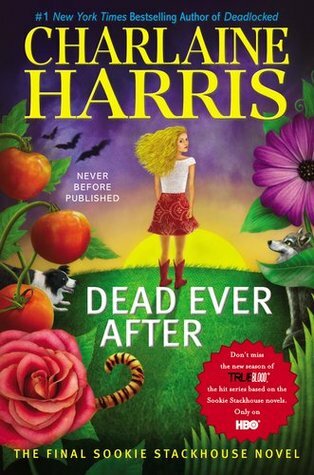 Dead Ever After is the 13th, and final, book in the Sookie Stackhouse series by Charlaine Harris. I started these books before the TV series came out in preparation of getting to know the characters. While the first season of True Blood took a lot from the first book there were enough differences there to make it it’s own. Over the past few seasons the books and the TV series have grown further and further apart, to the point where it felt like some things were thrown into later books just to spite the series. All that being said, it was bittersweet to find out this would be the last in the series as it’s been a blast to visit my home state…even if it was just via a book. Sookie Stackhouse finds it easy to turn down the request of former barmaid Arlene when she wants her job back at Merlotte’s. After all, Arlene tried to have Sookie killed. But her relationship with Eric Northman is not so clearcut. He and his vampires are keeping their distance…and a cold silence. And when Sookie learns why, she is devastated. As I mentioned Dead Ever After is the last book in the series and I really hate that. I loved how the series started and the first several books left me wanting more. However, around book 10ish I started to become “Meh” about the series. The books had become kinda predictable, it seemed like some things were thrown in just to contradict the TV series, and the connection that I felt at the beginning just wasn’t there. So when I learned that a new book was coming out my first thought was “Great…I wonder if I should just not get it and watch just the show instead of reading the books and watching.” And then I heard that it was going to be the last book in the series and I realized that while I had become Meh about the series I NEEDED to see how it ended. So I decided to read it…and I wasn’t disappointed. Dead Ever After picks up right after Deadlocked with Sookie having to deal with the repercussions of using the cluviel dor on Sam. Not only is Sam…not quite right, after being brought back but Eric is acting strange as well. I loved reading how this all played out, especially since every time I guessed what would happen something different would happen. On top of dealing with Eric and Sam’s issues Sookie also has to deal with Arlene being back. From the point where this story line first started playing out I knew what was going to windup happening but I believe that was the point because ultimately while I was right, I was oh so wrong as well. Finding out who was behind the whole thing and why was unexpected. Especially when you sit down and think about the fact that with the person who winds up being the one trying to take down Sookie, that means that in actuality someone that Sookie thought she could trust knew this person would try to hurt her and did nothing to stop it. Ultimately, I felt that the book was great in itself, but due to splitting the Coda off, as a finale to a series it was a bit lackluster. If the Coda had been an Epilogue instead I would have given it a full 5 out of 5. Thank you for your well written and honest review. My friends who read the series had mixed feelings about it. I know a lot of lovers and a lot of haters. So I decided to get the series in audiobook form to listen to.